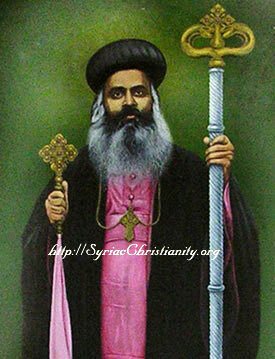 Mor Severios Paulose was the Metropolitan of Kochi diocese of the Jacobite Syrian Church from 1948 till 1962. He was born on 6 November 1910 as the son of Kunjittyappan and Elijiya of Muliyirickal family of the Cherai St. Mary's Church. It was Valiya Thirumeni (the late Malankara Metropolitan St. Athanasius Paulose) who ordained him 'Korooyo' in 1926, 'Kassisso' in 1930 and 'Ramban' on 19 August 1934. He was elected to the office of Metropolitan in 1944 at the representative meeting of the Kochi diocese held at Karingachira Church. Two years later on 4th August 1946, he and Kassisso Thomas Varghese Vayaliparambil (for Angamali diocese), were ordained Metropolitans by names, 'Mor Severios' and 'Mor Gregorios', in a ceremony officiated by the Patriarch of Antioch & all the East Moran Mor Ignatius Aphrem I at the Patriarchal Cathedral (Soonoro church) in Homs, Syria. On return to India in October, the Metropolitans took charge of their respective dioceses from Valiya Thirumeni. Mor Severios, a Syriac Scholar, for long was the General Secretary of the Malankara Jacobite Syrian Sunday School Association. He taught Syriac to the deacons at the Malecuriz Dayro and the Thrikkunathu Seminary. Ever since his consecration, Mor Severios worked hard to bring the Kochi diocese to the fore front. The Zion Seminary at Koratty (founded in 1939) and many other churches in the present Kochi and Malabar dioceses are his standing monuments. The Koratty Seminary happened to be the diocesan headquarters and also the Metropolitan's residence ever since Mor Severios took charge of the diocesan administration. (Though the ownership of this Church property at Koratty that was established with the contributions and efforts of the Jacobite Syrian Christians of Kochi diocese rests with the Holy Patriarch of Antioch, the Church nor its founder members does not have any control over it since the unfortunate schisms of 1970's. It now functions as the Metropolitan's palace of Malankara Orthodox Church that separated from the Universal Syrian Orthodox Church in the last century). When in 1958 a peace accord was signed with the Malankara Orthodox faction at Kottayam, Mor Severios was away in Malabar; it is said that he was greatly disillusioned with the sudden and unforeseen turn of events. A large section of the Syrian Christian faithful were also unsure of the outcome of the said agreement. However, since this compromise, Mor Severios complied with that new set up until his passing away. 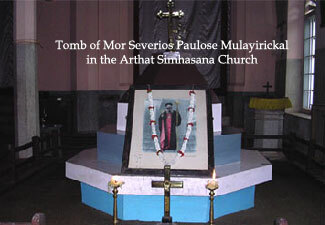 The demise of Mor Severios happened unexpectedly on 17th March 1962 when he was at the Arthat St. Mary's Simhasana Church, Kunnamkulam. The remains of the Metropolitan were interred in the Simhasana church, next day. The mortal remains of the St. Osthatheos Sleeba who passed away on 19th March 1930 also rests in this famous church. Because of the tomb of the holy father (St. Osthatheos Bava), the church is popularly known as "Bava Pally". The tomb of Mor Severios stands on the extreme right side of the Haik'lo of this Simhasana church. Paulose was born on 6 November 1910 as the son of Ittoop (Kunjittoop), Mulayirikkal of Valiya Pally, Cherai and Elachi, Vallathukaran, Nedumbassery. He was affectionately called Kunju at home. He had two brothers, Yacoub and Varghese. Yacoub was the son by his father’s first marriage. Paulose used to stammer in his childhood. He started talking as well as walking only by the age of three (Mor Severios Smaranika, 1962). He attended school only when he was eleven years old and for the next three years, he learned Syriac from Varghese Kathanar, Murimattom, the parish priest of Ayyampilly church. When he was fourteen, he joined Rama Varma Union School, Cherai to pursue English education. ‘Valiya Thirumeni’ of Alwaye ordained him a deacon at St. George church Arakkunnam in 1926. He continued his High School education thereafter and passed school final examination in 1929. He shifted his stay to Thrikkunnath Seminary, Alwaye as per the orders of Valiya Thirumeni. Deacon Geevarghese Vayaliparambil and Deacon Paulose Mulayirikkal were classmates at the Seminary. He improved his knowledge in Syriac under the tutorship of Malpan M. T. Ittira. Valiya Thirumeni ordained him a Kassiso in 1930. Father Paulose was an expert in the rendition of Syriac songs and transcribing Syriac books. He could also assist the junior deacons in their studies. Fr. M.I. Paulose, Mulayirikkal and Fr. M. Kuriakose, Vanchithattil were elevated to the order of Rambans by Mor Athanasius Paulose at Thrikkunnath Seminary, Alwaye on 19 August 1934 (Chingam 6). Rev. Paulose Ramban shifted his stay to Koratty in 1939 and constructed ‘Sinai Ashram’ in the name of ‘Mor Kuriakose Sahado’. The Syrian Christians in Mambra used to go to Thabor church in Peechanikad to participate in the Holy Eucharist until then. A church as well as a church building came up during his five years stay at Koratty. accompanied them back to his native place. It was ‘Valiya Thirumeni’ of Alwaye, the spiritual mentor of Paulose Ramban, who endeavored to lift him to the rank of the Metropolitan. For sixty years from 1886 to 1946 (at the demise of Mor Deevannasios Shemuvoon), the Cochin diocese was under the administration of Malankara metropolitans. Hence, the diocese had no assets or institutions of its own. The diocese had rejuvenation from the time Mor Severios took up the reins of diocesan administration. Mor Paulose could acquaint himself with many in Malankara due to his stay and training with ‘Valiya Thirumeni’ at Alwaye. He could also establish a strong friendship with the delegate of Antioch, Mor Yulios Elias Bava. Following the peace accord signed in 1958, an attempt was made to transfer St. Mary’s Syrian Simhasana church, Arthat, which was directly under the administration of the Patriarch of Antioch, to the Cochin diocese. This triggered off many problems in Kunnamkulam. 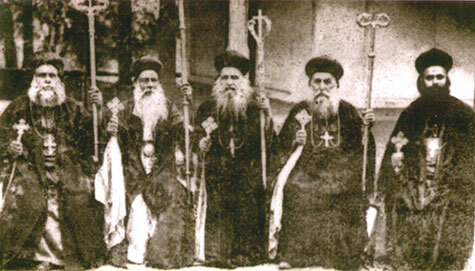 Mor Severios arrived on a Wednesday 14 March 1962 at Kunnamkulam by night to conduct the Dukrono festival (March19) of Mor Ostahathios Bava. In the context of litigations going on in court, many priests and lay people helped him in his efforts against the object of foundation of the church. From 1959 onwards, Mor Yulios Elias Bava, the delegate of Antioch, was not allowed to enter the Simhasana church. Mor Severios walked two furlongs to Arthat Valiya Pally on a Friday evening on 16 March 1962. He experienced chest pain on the way and returned to Simhasana church on Saturday 17 March. The chest pain aggravated after lunch and he succumbed to it. His assistants stated his desire to be buried in Koratty Seminary. Many assumed if he was buried in the Simhasana church, it would enhance and support the reasons for bringing the Simhasana church under the diocese of Cochin. On the strength of this argument, his mortal remains were interred on the south side of the church. His death anniversary is on 17 March.